Resembling a baroque castle, the enchanting Park Inn by Radisson Sofia compound is comprised of three ornate buildings that combine the hotel with two apartment houses nestled in a lush, secluded garden. Park Inn Sofia is located in the elite Lozenets district among the freshness and quietness of the beautiful Loven Park in Sofia. It is close to many business centers, Maleeva tennis club and Tokuda Hospital. Park Inn Sofia is situated 5 km away from Sofia Airport and 3 km away from the city centre. 77 rooms and suites, 18 one-bedroom apartments and 18 two-bedroom apartments, the hotel is ideal for short-and long-term guests. The Greenville Restaurant offers exquisite International cuisine, healthy dishes and fine wine selection. The stylish restaurant can seat 80 guests. During the summer there are another 30 seats available in the pretty garden. Greenville is one of the preferred restaurants in Sofia for special corporate events, private parties and weddings. The Lobby Bar is separated in one of the two towers of the hotel. This is the place for business and private meetings where you can enjoy a glass of drink in a pleasant atmosphere. The Cigar Lounge is located in the other tower of the hotel. The admirers of the quality brandy and aromatic cigars will definitely appreciate this place. 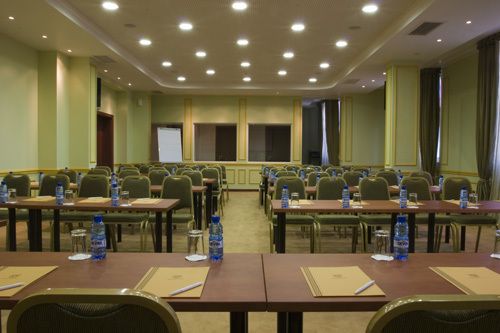 Park Inn Sofia offers two fully-equipped conference rooms - Serdika with a total capacity of up to 100 guests and booths for simultaneous interpretation and Pliska - up to 40 guests. Both rooms have natural daylight, multimedia, flip chart, sound system, screen, telephone line, air conditioning with individual temperature regulation, Internet access. The Business Centre of the hotel provides all office services - computer, printer, fax, telephone line, Internet access.